Members of the Gallia Academy girls golf team accept the championship trophy after the 2018 Waterford Invitational on Wednesday at Lakeside Golf Course. WATERFORD, Ohio — Another day, another championship. One day after winning the Logan Invitational at Hocking Hills Golf Course, the Blue Angels followed it up by winning the Waterford Invitational at Lakeside Golf Course on Wednesday in Washington County. 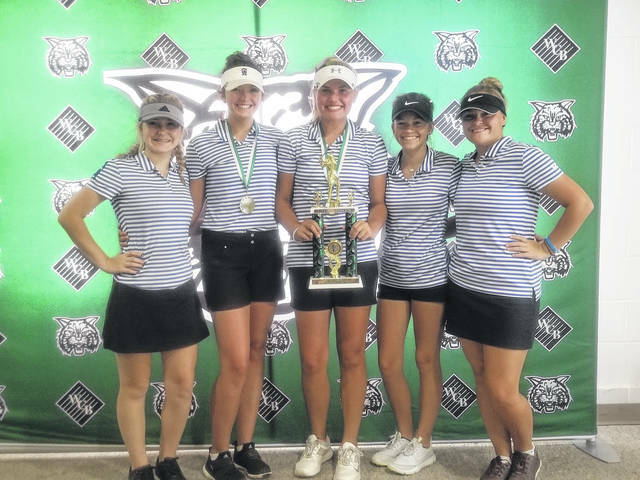 In the play five, count four format, Gallia Academy — one of four local schools competing in the invitational — won the girls title with a score of 370, 16 strokes ahead of runner-up Logan. Molly Fitzwater led the champion Blue Angels with an 84, one stroke ahead of teammate Hunter Copley. Bailey Meadows was next with an 87, while Carley Johnson and Avery Minton each scored 114. The Lady Marauders — who totalled a 402 — were led by freshman Shelbe Cochran with a 98. Caitlin Cotterill and Kylee Robinson both carded 99s, while Mikayla Radcliffe capped off the team score with a 98. The boys’ small school division was won by Barnsville with a 334, taking the fifth-score tie-breaker over New Lexington. Southern was third with a 350, 11 strokes ahead of fourth-place Eastern. The Tornadoes were led by Jarrett Hupp, who fired a 9-over par round of 79, good enough eighth place overall. Jensen Anderson was next for Southern with a 89, followed by Joey Weaver with an 89. Landen Hill’s 94 rounded out the Tornado total, with Ryan Acree’s 101 serving as a potential tie breaker. Eastern was led by Ryan Harbour with an 83, and Jasiah Brewer with an 88. Kylee Tolliver’s 92 and Nick Durst’s 98 rounded out the team total, with Ethan Short’s 113 as the potential tie breaker. Coshocton won the big school division with a score of 293, 36 strokes ahead of second place Warren. The MHS ‘A’ team — recording a 375 — was led by senior Wyatt Nicholson with a 10-over par 80. Bobby Musser was next with a 91, followed by Cole Arnott with a 101 and Trenton Peacock with a 103. Brayden Ervin fired the non-counting round of 109. The Marauder ‘B’ team was led by the duo of Bailey Jones and Gus Kennedy, who posted matching 106s. Dawson Justice’s 109 and Austin Mahr’s 118 rounded out the team score of 439.